Last week, London Client Service Associate Connie Van Stroud sat down with Natasha Bhana, AlphaSights’ Head of Recruitment for Europe, to pick her brain on all things interview related, and find out what she enjoys most about leading our recruiting efforts for AlphaSights’ Associate Programme. Can you tell us a little about your background and what led you to AlphaSights? After graduating from The University of Manchester with a BSc in International Management, I began my career at Apple, and joined their Retail Graduate Scheme. During the scheme, I completed a ‘People’ rotation, which is when I discovered my passion for recruitment and the hiring process. Once I completed the scheme, I decided to pursue a career in Recruitment, and took a Junior Recruitment Coordinator role at McKinsey. From there, I moved to a Digital Marketing agency called Merkle | Periscopix where I grew the recruitment function and created and implemented Early Career Programmes. I finally joined AlphaSights a year ago — I was intrigued by the firm’s fast-paced, high growth environment and immediately wanted to be a part of helping us continue to scale and succeed. It’s extremely motivating to see our London training room full of new faces each quarter because of the work the recruitment team does — the outcomes of our actions are completely tangible, which helps drive me and the team forward. 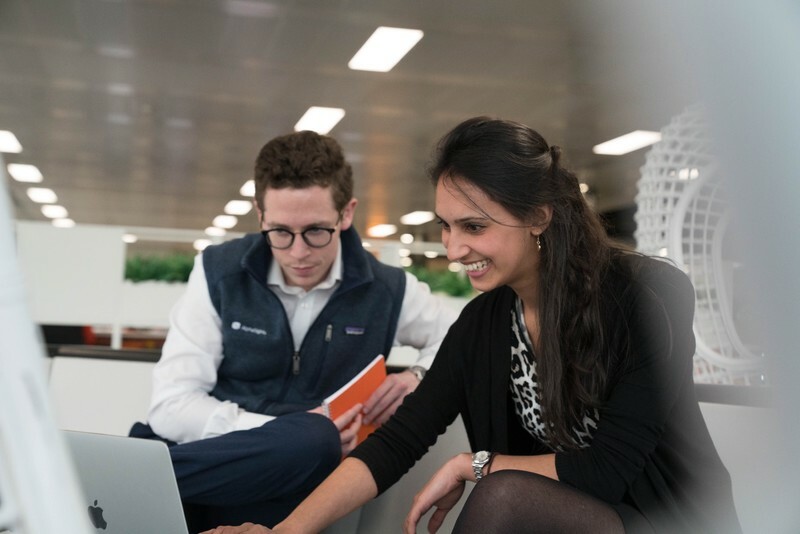 What’s unique about recruiting for our Associate Programme in Europe? It has to be the incredible variety of people we get to speak to. One of the things I love about AlphaSights is how different everyone is — in terms of their background, education, interests — while sharing the same values and work ethic. We have a big need for languages amongst our Associates due to our international client and advisor base. Consequently, we draw interest from graduates who have grown up across Europe or even further afield. From a recruitment perspective, it presents my team with the opportunity to get creative in our approach and outreach strategies. Connecting with and encouraging German-speaking candidates to apply can be completely different from connecting with French-speaking candidates, to Swedish-speaking candidates, and so on. As a team, we aren’t scared to make mistakesand feel empowered to try new things month on month. If something doesn’t work, we learn from it and move on. When it comes to the Associate Programme, does AlphaSights require a particular degree type? No definitely not. Every degree has transferable skills but the best candidates will be able to pick those out and think about how they will support them in the role at AlphaSights. We have Associates and Managers who have studied everything from Classics, Philosophy, and Law, to Engineering, Maths, and Business. We’re always on the lookout for fluency in another language, but you don’t have to have studied the language in question. In fact, many of our Associates’ second language is actually English. What are some of the key academic or extracurricular activities and achievements you look for? We work in a performance driven environment so ultimately any experience that shows you are comfortable being in that environment is a plus, be that being part of a sports team — which highlights your competitive side — or leading a society — which demonstrates your drive. All of our employees are incredibly ambitious and driven, and the Associate role demands strong organisational and project management skills. Having already juggled multiple responsibilities outside of your core studies will certainly assist you with your day to day responsibilities here. What is the interview process and how can candidates best prepare for it? CV and phone screen: This typically lasts 10–15 minutes. We’re looking for strong academics and a desire to be in a target driven organisation. First round interview: A strengths based interview where we’ll dig deeper into your experience to date and aim to find out what really motivates you. Case Study interview: A very practical introduction to the Associate role. This exercise is an opportunity to demonstrate your problem solving skills and how you would treat client requests. Final interview: A final interview with one of our Vice Presidents. They will reflect on your decision-making capabilities to date, and discuss how AlphaSights fits with your long term career plans. Is there a ‘bad’ answer to the question: Why do you want to work at AlphaSights? There are no ‘bad’ answers to that question — everyone has different motivations for applying and wanting to be a part of AlphaSights which we respect. However, the strongest answers I hear often focus on the parts of the role the person is most excited about. For instance, I would consider expressing your desire to work towards clear goals and targets, or getting the opportunity to interact with advisors/experts from across a wide range of industries a stronger answer than “because you have such a cool office” (which we’re lucky enough to have too!). What would you consider your ‘best’ interview at AlphaSights? What made the candidate stand out? Great question! In my first few months I met a French speaker who was really outstanding. She had done all her research and understood our business model very well — which meant our meeting felt more like a conversation than an interview. She understood the skills she would gain from the Associate role and how they’d benefit her longer term plans; that level of career clarity was impressive. The questions she asked also showed a genuine interest in the business and life at AlphaSights, versus relying on some of the more generic questions that are often plucked from a list online and asked for the sake of it. So I’ve made it through the four stages and just started as an Associate at AlphaSights; what does my career path look like? Apply for manager elevation in your home office — if successful, you’ll own client accounts and lead your own team. Apply to move to one of our international offices as a specialist — besides London, we have offices in New York, San Francisco, Hamburg, Dubai, Seoul, Shanghai, Hong Kong, and Tokyo. After three years as a manager, you become eligible to apply for Vice President. For Associates who choose to pursue a career outside of AlphaSights, what type of roles/companies do they tend to go into? There are too many to choose from! I’ve known AlphaSights Associates and Managers to go on to pursue careers in Business Development, Marketing, Sales, Finance, and Consulting. We maintain great relationships with the vast majority of our alumni and they sometimes return to the office to hold talks, or just socialise with past colleagues and get to know the new additions to the AlphaSights family. The beauty of the Associate Programme, and AlphaSights as a whole, is its tremendous learning and development opportunities — including the extensive professional training our people receive — and the skills they develop as a result. Having strong organisational, project management, communication, delegation, conflict resolution, and negotiation skills (to name just a few) are invaluable to any business. For any students or recent grads reading this who want to find out more, where can they meet you in person? 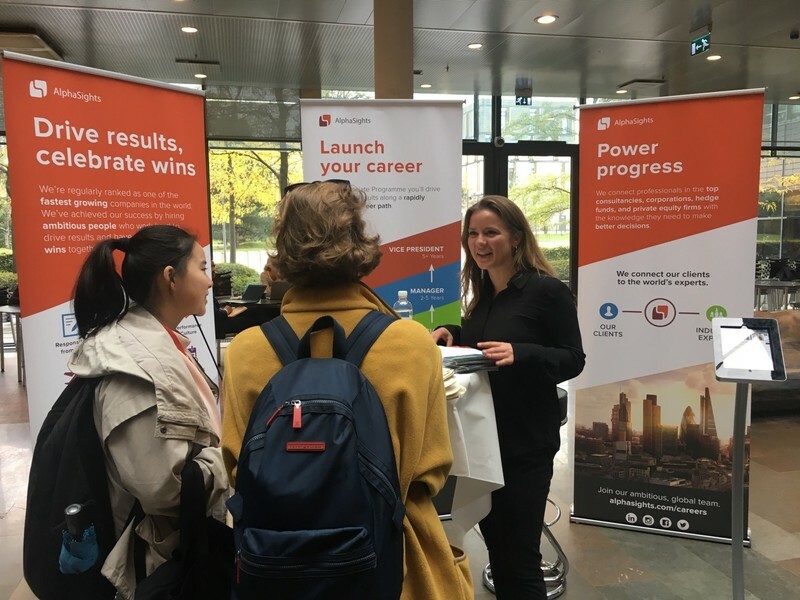 We try to go as many careers fairs and campus events as possible, and it’s worth regularly checking our Facebook page to stay up to date with our schedule. Up next is the Rotterdam School of Management on the November 5th, and Imperial College London on the 7th. The recruitment team always travels with a couple of Associates or Managers from our Client Service team so we can give visitors to the AlphaSights stand real-life examples and a feel for the fantastic people they’d be working alongside. Natasha Bhana joined AlphaSights in November 2017 and serves as a manager on our Recruitment team in London.